As a follow up to yesterday’s post on Peeps, I wanted to share with you an awesome discovery for Thirsty Thursday – Peep Drinks. This site is FULL of recipes that feature Peep garnishes. Here are some of my favorites. 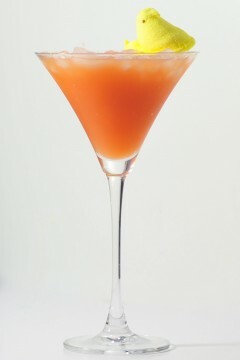 Mix as a martini, add pretense, garnish with peep. Place cinnamon on a saucer. Wet the rim of the martini glass, and slide it around upside-down on the saucer to apply the cinnamon rim. Fill a large shaker with ice, and add all three ingredients. 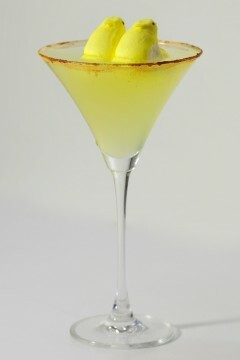 Strain into martini glass, carefully avoiding the cinnamon, and float two peeps on top as garnish. 1. Fill a martini glass with crushed ice and cold water, to begin chilling the glass. 2. Over a small plate or cutting board, rub the whole row of peeps between your hands until the frozen and colored sugar coating rains onto the surface below. This will be a messy nuisance, getting all over your hands — just deal with it. 3. Fill a large shaker with ice cubes, add tequila and triple sec first, then lime juice and confectioners’ sugar (or substitute 2oz simple syrup). 4. 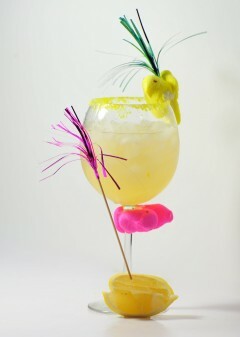 Dump the icewater from the martini glass, and rub the upside-down glass in the “peep dust” to create the colored sugar rim. 5. Carefully refill the glass with crushed ice. 6. Shake the shaker, strain into martini glass over the crushed ice, and garnish as illustrated.